My work is made particularly satisfying when there's a lovely point of reference to begin with on a project. Here my clients had a rather special and unique collection of books and were looking for an individual piece of furniture to display them. After a fruitless search for an appropriate old /vintage piece of furniture to house the books the clients decided to enrol the help of furniture designer/maker Jacob Littlejones and have a bespoke furniture piece made. The clients requested not to have it made of MDF (hurray!) 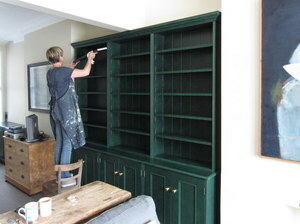 so Jacob recommended tulip wood because of its relative flatness and stability.See his blog about this project here.http://www.jacoblittlejones.co.uk/blog/project-bookcase-1. 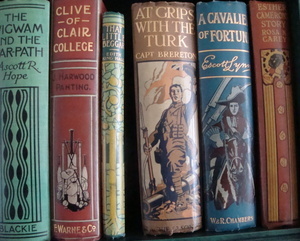 The collection of Late Victorian/ Early Edwardian books were fascinating in themselves; mainly stories for boys with tales of empire,adventure and morals of the era. Most importantly for me though were their lovely clothbound covers with visually striking pictorial designs and typography. Initially it was thought best to keep the paint job on the furniture simple;the worry being that by using anything other than a single complimentary flat colour could possibly detract from the book covers colours and design. HK Arts colour consultation began with around 8 carefully chosen colours that we thought would both sit well in the room and also form a good background colour to display the books and their glorious covers. However, after some deliberation the clients presented me with a piece of fabric that had caught their eye and asked to see if I could come up with a colour and paint finish that looked similar. You can see in the picture below the fabric and HK Arts colour swatches and workings out. With request from the clients Jacob designed and built the bookcase as a modular piece made up of 3 seperate units for ease, in case of a future house move. Here's the last shelf going in! .....and complete with the book collection. You may just be able to see in the close up pictures below that there is a slight grain to the tulip wood which ultimately I think adds quality and character overall. Much nicer than MDF! And lastly a big thank you to Jacob Littlejones for the use of his lovely workshop for this project.